The right place for departure to Langkawi / Medan or for a wonderful night in the casino offshore in international waters is the Swettenham Pier. This pier is located near the Clock Tower, Fort Cornwallis, and Penang Tourism Malaysia. The pier was named after Frank Swettenham, a colonial administrator, who was responsible for the development of roads, trains and social services in Malaysia. He was even Resident General (1895) of the Federal Malay States, which was formed by a number of kingdoms (then part the current Malaysia). The Swettenham Pier has been a location in the movie "Anna and the King". It represented in the movie a Siamese port from the 19th century. Until a few years the Swettenham Pier was used for the storage of tuna fish, which was captured in the Strait of Malacca. The new Swettenham Pier has two berths with 400 meters long, and have a depth of 9.5 meters. It is the mooring place for cruise ships that call at Georgetown. It can cruise ships with over 3,000 passengers moor. The new 400m pier is 34m longer than the old one, which has since been demolished. The new pier can handle monthly about 100,000 passengers, compared to 50,000 with the old pier. Near the Swettenham Pier there is a small offices, where you can buy tickets for the boat to Langkawi/ Pulau Payar and Medan (Indonesia). Off course these "travel agencies" can be found elsewhere in the city. There you can also buy tickets for the boat. On the left side of the office at the Swettenham Pier is the entrance to the ferries. The three-storey terminal building has the ideal facilities for cruise passengers arriving and departing. 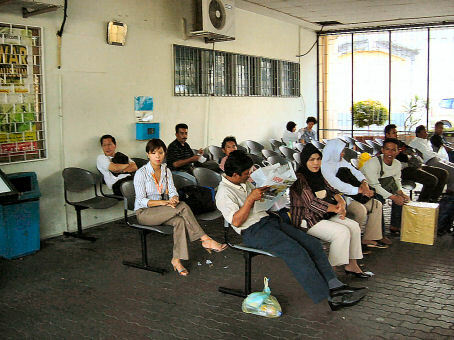 After you've gone through the gate you'll enter the waiting room. Look at the photo at the right. If you have booked a trip to Pulau Payar, the tour guide arranges everything for you. If you're going to Langkawi, then you yourself time for yourself before "boarding". Should you however travel to Medan, then you have to pass the customs and have to give them your "immigration card". The Customs The ferries to Langkawi / Pulau Payar are very up-to-date boats with seats, in which you can lean back, similar to chairs in a modern bus. Also, all boats are in good air conditioning. 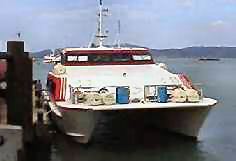 The company (Langkawi Ferry Services Sdn. Bhd.) has about 10 boats and they are quite proud that there has never been an accident with the boats. In the cabin on the boat are sufficient "life jackets (jackets) available". In each ferry of the company goes about 120 to 200 passengers, depending on the boat, which you are travelling with. So hundreds of people travel daily from Penang to Langkawi v.v. Daily there are two ferry going from Penang to Langkawi. The departures times are at 08.30 and 08.45 in the morning. 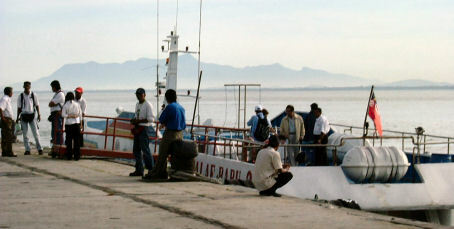 The last boat goes along Pulau Payar. That's afst boat. The passage takes about 2 hours and 30 minutes. The price of a ticket is RM40,00 one way. For return ticket (same day return) you pay RM75, - The boat goes only once a day! The last year's ticket price increased several times, because the oil price still went up. The boats are quickly and every passenger has his own story. Some do very well against the waves of the sea. Others don't. Fortunately, you don't have to stay in the cabin and you can go on deck for a breath of fresh air. Formerly the ferry to Langkawi beneficial to the local people. But flying between the islands with the budget airlines, like Air Asia or Firefly, is also very cheap today. The boat is still a very good alternative. One does not go to the airport, where you have to be on hour in advance and the ride to the airport still takes a moment with all the traffic. A boat trip is always fun, with a stop at Pulau Payar. Although some (mostly Malays) sometimes seasick. From the Swettenham Pier departs in the evening another boat. It is a special boat, with a casino aboard. In Malaysia, it is forbidden to gamble, except in the Genting Highlands. If you want to go to a casino you must be no Muslim and you must have the age of 21 years. People (Chinese) are inventive, so late in the evening and morning a boat sails into international waters. 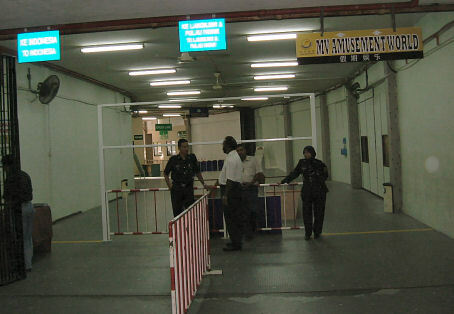 Once outside the border of Malaysia is gambling permitted. Around 11:00 in the morning the first casino ship departs from the Swettenham Pier. Middle-aged people can be seen boarding. The "touts" with their red packets waiting at the entrance to the pier for potential customers to lure for the casino boat. The boat sails into international waters, 12 miles off the coast, and then the casino opens ...... and goes back in the evening to Penang.